Even where snakes are common, they can be difficult to observe because they are shy and easily disturbed. Through good fortune and patience we’ve been able to record brief moments in the lives of wild snakes. 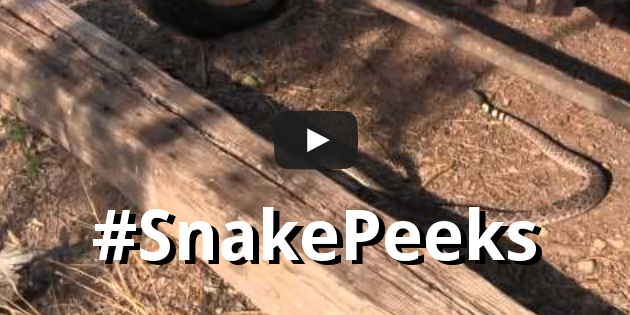 Snake Peeks, our new video series on YouTube and Instagram, brings you glimpses of the daily lives of snakes. These portraits of behavior may oppose what many (most?) people imagine snakes do. That snake that lies in wait to attack and bite a person does not exist. Boyett, an Arizona black rattlesnake, courts a small female. Although little is known is about snake communication, she seems to be resisting his advances, yet Boyett is undeterred. Although known as ambush, or sit-and-wait, predators, rattlesnakes will sometime actively forage for prey too. Here a western diamondback rattlesnake pursues a desert spiny lizard. Western diamondbacked rattlesnakes often hunt near watering holes for birds and other animals coming to drink. What happens when a broad-billed hummingbird shows up?